The iconic Roddick Gates, which turned 90 years old last year, are getting a structural makeover. Learn more about the meticulous restoration of this historical McGill landmark. 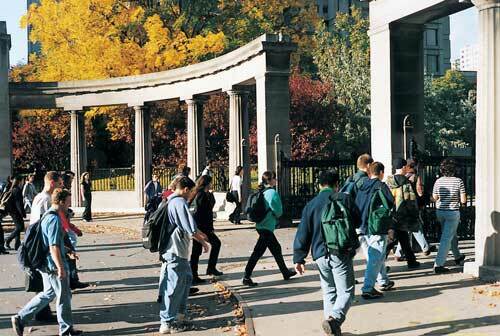 Each year, hundreds of thousands of people pass through McGill’s iconic Roddick Gates. Montreal’s streets aren’t the only things being spruced up in anticipation of the city’s 375th anniversary next year. The Roddick Gates – the iconic main entrance to McGill’s downtown campus – are also getting a much-needed structural upgrade. The two sweeping curved Greek Doric colonnades, which were unveiled on May 28, 1925, are currently undergoing a meticulous restoration in accordance with the gates’ protected status as part of the historic and natural district of Mount Royal. Although the Roddick Gates received a 2010 electrical makeover in order to get the clock in the western colonnade running smoothly, all the gates’ stonework dates to 1925. Approximately 250 grey Indiana limestone blocks sit atop a base of 35 Deschambault limestone units. Those stones will be cleaned and the mortar joints will be redone. A near-century of exposure to the elements has left some of these stones fractured beyond repair; those blocks will be replaced with new stone of equal quality. The structural supports of one of the main columns will also be replaced, the concrete fences along Sherbrooke Street will be cut back so they no longer rest against the gates, and the ironwork will be restored. The monument restoration is being overseen by EVOQ, an architecture firm specializing in the conservation of historic buildings and sites. (EVOQ’s practices incorporate Parks Canada’s Standards and Guidelines.) The masonry and structural work is expected to be completed by the end of March 2017. Once the gates have been repaired and restored, work will begin on the surrounding area. Concrete paving stones, benches, and lights will be installed, he says, “to both improve the pedestrian flow, and to adapt the space as a place where people can meet, wait and even hold events.” New hydraulic bollards will restrict vehicular access to campus. This work will be done in stages, and is expected to be completed by October 2017. 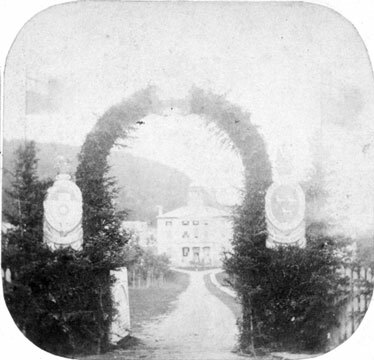 The gates were a gift from Lady Amy Redpath Roddick, in memory of her late husband, Sir Thomas Roddick. Dr. Roddick served as McGill’s Dean of Medicine from 1901 to 1908, and pioneered the use of antisepsis to help prevent infection during surgery. 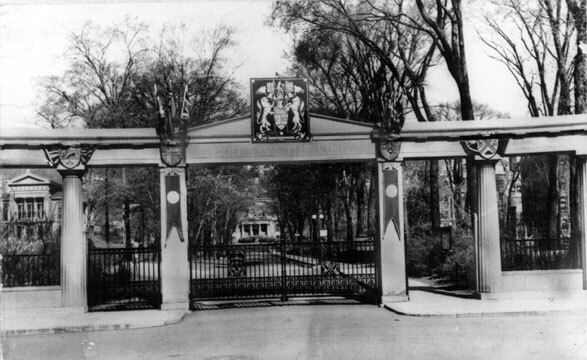 The Roddick Gates were designed by architect (and McGill grad) Grattan Dalrymple Thompson. “This work will ensure that the Roddick Gates will last as an enduring icon of McGill University and of Montreal,” says Nicolicescu. The Roddick Gates restoration is a project of three departments in McGill Facilities Management and Ancillary Services (Project Management, Design Services, and Campus and Space Planning), EVOQ Architecture and the Tetra Tech electromechanical and civil engineering firm.